Revelation 21:10-27 describes the New Jerusalem at the end of time. It is exquisite and the writer of Revelation struggles with words to describe it’s glory and magnitude. 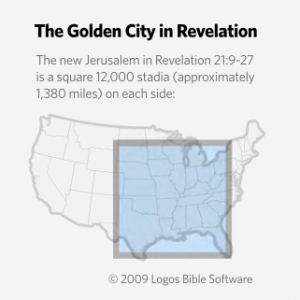 So, how large will the New Jerusalem be? Here is a diagram superimposed on a map of the United States. Many people, especially the Orthodox Jews, discuss the building some day of the new Temple. Sorry, there will never be a “new Temple” since that new Temple is already being built. It is the Body of Christ, the Church. The Gospel of John tells us, “The Jews then said to him, “What sign have you to show us for doing this?” Jesus answered them, “Destroy this temple, and in three days I will raise it up.” The Jews then said, “It has taken forty-six years to build this temple, and will you raise it up in three days?” But he spoke of the temple of his body” (John 2:18–21). And St. Peter tells us more, “And like living stones be yourselves built into a spiritual house, to be a holy priesthood, to offer spiritual sacrifices acceptable to God through Jesus Christ” (1 Peter 2:5). Our destiny is marvelous, exciting and for all of eternity. But I wonder, does the size of the New Jerusalem imply there may be fewer people there than the universalists think? The New Jerusalem described in Revelation is roughly the size of the moon. Furthermore, the size of the earth was known at the time, at least among academics, and that, together with the apparent size of the moon and observations of lunar eclipses, is enough to work out the size of and distance to the moon. At any rate, the city is much too big to be taken literally, which is the point. Unless it’s a Borg mothership.